According to a new market research report published by Transparency Market Research entitled “Prepaid Wireless Service Market: Type (Data, Voice); Connectivity (2G, 3G, 4G) - Global Industry Analysis, Size, Share, Growth, Trends, and Forecast, 2018 – 2026,”the global prepaid wireless service market is expected to reach US$ 659.1 Bn by 2026. The market value is anticipated to expand at a CAGR of 4.3% during the forecast period from 2018 to 2026.The market is expected to grow largely due to shift of consumer preference from postpaid to prepaid services, largely in the regions of North America and Europe. Geographically, the global prepaid wireless service market is segmented into North America, Europe, Asia Pacific, Middle East & Africa, and South America. Asia Pacific dominates the market with a share of more than 50% in 2017, followed by Europe with approximately 20% share. The dominating share in Asia Pacific is primarily due to tremendous growth in the adoption of smartphones among both millennial and older population. In Asia Pacific, key countries contributing to the prepaid wireless service growth are China, India, Japan, and Indonesia. Asia Pacific has the largest subscriber base for prepaid wireless service in the world. The region has the largest population in the world which therefore makes it the largest market for prepaid wireless service. These countries have an active base of smartphone users across all age groups. Moreover, the market for prepaid wireless service is increasing due to continuous demand for affordable and flexible data and voice plans. In 2017, Asia Pacific was evaluated as the largest market for prepaid wireless service. India, China, Indonesia, and Japan are particularly attractive markets for prepaid wireless service. However, Rest of Asia Pacific is expected to expand at the highest CAGR during the forecast period, 2018-2026. In the region, a large portion of the population prefers prepaid wireless service over postpaid, the reason being affordability and flexibility to switch network operators easily. In Europe, some of the key countries contributing to the growth of the prepaid wireless service market are Germany, France, and Italy. The market for prepaid wireless in Europe is largely driven by offerings of MVNOs. MVNOs, over the last couple of years have become quite significant in terms of their operation. Some of the well-known MVNOs operating in the market have been providing attractive voice and video plans to the subscriber base, thereby adding to the growth of the market. 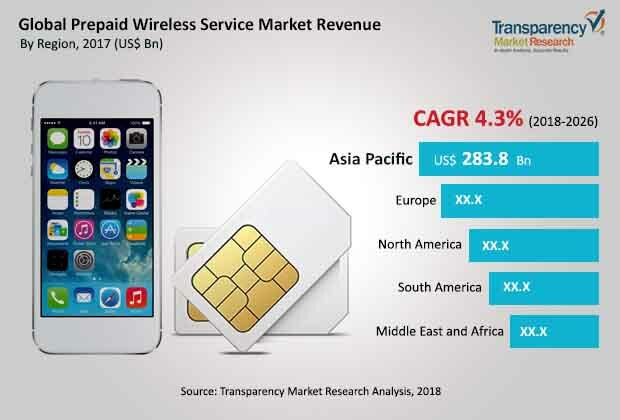 Globally, the prepaid wireless service market is segmented based on connectivity and type. In terms of connectivity, the market is segmented into 2G, 3G, and 4G connectivity. Based on type, the market is segregated into data and voice. In terms of connectivity, 4G occupies the largest share of more than 50% in the overall prepaid wireless service market. Demand for 2G connectivity has drastically fallen over a period of time largely due to rollout of 4G/LTE connectivity which is much faster. Moreover, after the commercial roll out of 5G services, 3G connectivity services will also start losing its market share. Based on type, voice has the largest share in the market. However, data type is expected toexpand at the highest CAGR during the forecast period. A large portion of the population globally is using internet for various purposes. Right from social networking to day to day financial transactions, mobile internet usage has drastically increased. This in turn has increased the demand for fast and cheap data plans across the globe. Millennials are the most active users of internet and they prefer cheap plans. Furthermore, due to several student exchange programs, many foreign students are enrolling in international universities. This has led to increased demand for cheap and affordable voice plans. MVNOs and MNOs are catering efficiently to this segment of the market. These service providers are offering attractive plans that include cheap international calls with additional benefits of video on demand services. Key players operating in the global prepaid wireless servicemarket areAT&T Inc., Sprint Corporation, Verizon Wireless, T-Mobile International AG, Deutsche Telekom, Vodafone Group plc, Orange S.A., Telefónica, S.A., Telstra Corporation Ltd., Telenor ASA, Emirates Telecommunication Group, Axiata Group, Bharti Airtel Limited, China Mobile Communications Corporation, and AméricaMóvil.